First off: I am not pregnant. Just figured I should get that out there before the comments fill up with congratulations and my mom calls. But, I have been pregnant (my son is now almost seven! ), and many of you dear readers who are pregnant now or anticipate being pregnant at some not-so-far-off date have emailed me asking for a link to a good maternity dress pattern. I only ended up making this one maternity dress (I got so big, so fast, that it seemed impractical to make something I'd burst out of, Hulk-like, before it was even hemmed). It's a great pattern (and I made it in an even better fabric: gorgeous Nicole Miller silk with lycra, a deep green with an abstract celery-green pattern of what looked like tangled webs). And that, my friends, is what I consider the key to maternity sewing: love your fabric. While pregnant, you will be wearing so much of it, so often, for so long, that if you have even the slightest doubt about your love for a particular fabric, don't buy it. This pattern is $5.99 from Lanetz Living (and check in the upper right corner for your discount!). It's sized up to B38, but I remember it as being very generous — so much so, that because my fabric had a bit of stretch, I was able to eliminate the back zipper. It was very easy to sew. And, by the way, if you are pregnant, congratulations! So much much much more elegant than that bare belly look pregnant mothers now like. So glad to know someone else understand the difficulties of clothing yourself while carrying 10 1/2 pound babies. I was in maternity clothes from six weeks on and grew out of them at about 6 months. I did laundry in my nightgown as I didn’t have enough clothes to wear everyday of the week. That looks like a great maternity dress, and would still look good for those after baby days when your belly feels like a bowl of Jello and just hangs there. during my baby years, every new clothing item I made/purchased was always evaluated on the possiblity of wearing it while pregnant also (money was scarce in those days). Glad those days are past. You know what else makes it elegant? No gathers under the bust. Just a very neat and tidy pleat. Clever. Very clever. You are so right about the loving the fabric. I was not ambitious enough to make my own maternity clothes but the few pieces I didn’t mind wearing so often were really soft or just great patterns. And I see where you are coming from with the superstition. I have hestitated to give away a lot of things for that very same reason. I must ditto the comment “love your fabric”. I made several pairs of work pants out of some nice Ralph Lauren wool, some wonderful stretchy skirts and had a few dresses as well. You wear them so much that buying nice fabric is well worth it.I recently gave away my rather large maternity wardrobe from 2 pregnancies to one of my friends. So far, not pregnant yet! However, according to a palm reader I went to a month ago there is a baby girl really wanting to come out in 12-18 months. Eek! 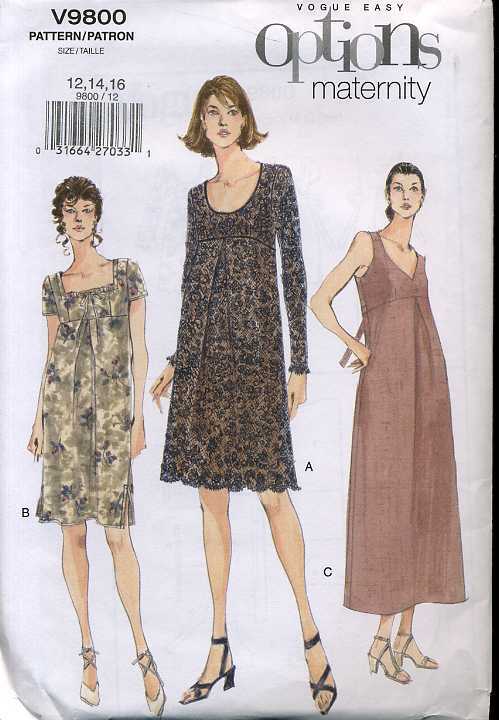 One of my classmates in a fit class was working on Vogue 1689 which is very similar to the pattern you posted. My classmate said she was going to make it shorter and in daytime fabric. I made this for a wedding in a beautiful blue/pear green silk dupioni while eight months into a very difficult (for me!) pregnancy. I tweaked it, of course – more of a jewel neckline and sleeveless – it was so pretty and flattering, it was one of those rare maternity pieces one wishes was in one’s regular wardrobe. Several strangers at the reception told me I looked “gorgeous” which I remember to this day, since it’s rarely heard (or felt) at that point in the process. I’m four months pregnant, and I’ve just ordered this pattern. I’m planning to make dress E in a pink toile fabric, and wear it with a big floppy hat and my pink espadrilles. This is a beautiful pattern. I’m beyond the possibility of ever being pregnant again (phew! ), but I love this pattern and was wondering how it would look on a non-pregnant person. Any thoughts? (I would like to avoid the awkward “are your pregnant?” Q&A)This is why I said “phew!”: speaking of 10 lbers., I’ve had 2! My most voluminous dress was stretched to the limit and I had to wear it every day to work for the last few weeks! I wholeheartedly agree that you better love that fabric! My first 10-lb. boy was not the star of the nursery that day; a 13-pounder had been born just minutes before. It’s all relative, I guess! I loved sewing while pregnant! The energy burst of the mid trimester is amazing. And I made little matching tops for my baby to wear after she was born and I was still wearing the tops until my body went back to normal. I haven’t had kids myself, as it happens, but reading these comments is lovely. Any comments on how this patten fits those who have a very large bosom? My daughter’s first pregnancy increased her double D’s to something else and she was miserable in most of her clothes. She’s only five foot tall so her baby, tiny, thank goodness, had no where to go except out, and she had trouble with eclampsia. She was a truly miserable bunny rabbit for nine months! Even the maternity tops I made her grew too small quickly. Since she will more than likely have another child in the next couple of years I’d like to be ready to make her something more comfortable. She will be in a much warmer climate, Louisiana or Oklahoma. She had one red sack dress that she wore in the last two months of her pregnancy last time and she doesn’t even want to see it again! I sewed both of my maternity wardrobes, many years ago. My first child was born in Texas so I made sundresses with little bolero jackets. I also copied a very expensive dress from Lord and Taylor, in the same identical fabric, to wear to an Xmas party. I gave those dresses away to a pregnant friend, because I was tired of them and decided,if pregnant again, I could make new things.My second pregnancy was in Boston and I sewed the most luscious mohair coat in a loosely fitted Geoffrey Beene pattern. I wore the coat out eventually. I have another version of the same coat now, in a black/brown check mohair…21 years later! Just about everything else I made in Jasco wool doubleknit. It was worth it. Although expensive, that fabric is warm and always looks good. I later converted the items to non maternity wear. I also copied a Chanel crepe dress for Easter. I wish I was as prolific now! So, I would agree that when people complain about maternity wear, which is hardly a new complaint, it is not always so much the style, but the cheap fabric and construction which is so unappealing. I was much happier with my own work and designs! Ha–I agree that you might jinx yourself! I just cut up my last maternity outfit (a wine-colored velvet number) for a gypsy costume at Halloween. I hope that I have the flu right now and that it isn’t morning sickness!!! beatyruth, it sounds like Petite Plus ought to add maternity patterns to their line. I made this dress for my first pregnancy 4 years ago (currently 30 weeks pregnant with my second child) and I loved it! I did the sleeveless v-neck version and wore it to Christmas etc when 8-9 months pregnant – I felt very elegant! It’s a great pattern – and I’m very excited to see a pattern I’ve made on this brilliant blog! I made this dress when pregnant with my 3rd. LOVED it. I felt so pretty. You can see it here. I had to do a full-bust adjustment to get it to fit the girls properly, but that’s a standard adjustment for me anyway. I’ve always loved the Lauren Sara maternity patterns. I agree, it’s all in the fabric. Your skin is so much more sensitive when pregnant. (I also made a few pairs of underbelly pants — loved those too!). darnit! i gave the wrong link for the dress i made. it’s here.i can hardly believe that baby is going to be THREE this august! I have a question about vintage patterns. When selcting your size do you go buy your actual fullest part of the bust measurement in inches (which is what I was assuming) or do you go by your bra size? So do I look for B44 (as in the actual inches) or B38 (as in 38DD bra0? And WHY are all the vintage patterns B34 and smaller?I know my grandmothers and greatgrandmothers needed a bigger B-size in their patterns. very nice! I wish I had something, anything, I liked when I was pregnant. What I really need now is to find a pattern or a dress that allows for nursing access. Until that day, alas, I wear skirts and tops instead. This post was published the day after I found out I am pregnant! I don’t think it’s a sign or anything… but I did just buy the pattern. ;)I’ve already made myself a cute maternity peasant top, and I can hardly wait to try and make this, my first dress! This blog makes me want to make all my own clothes. That way I can have the clothes I want, just the way I want them! I was wondering if anyone knows where I can get this pattern now? I have a friend who has graciously volunteered to sew a maternity dress for me and I am having the hardest time finding a good pattern! I love this one though!